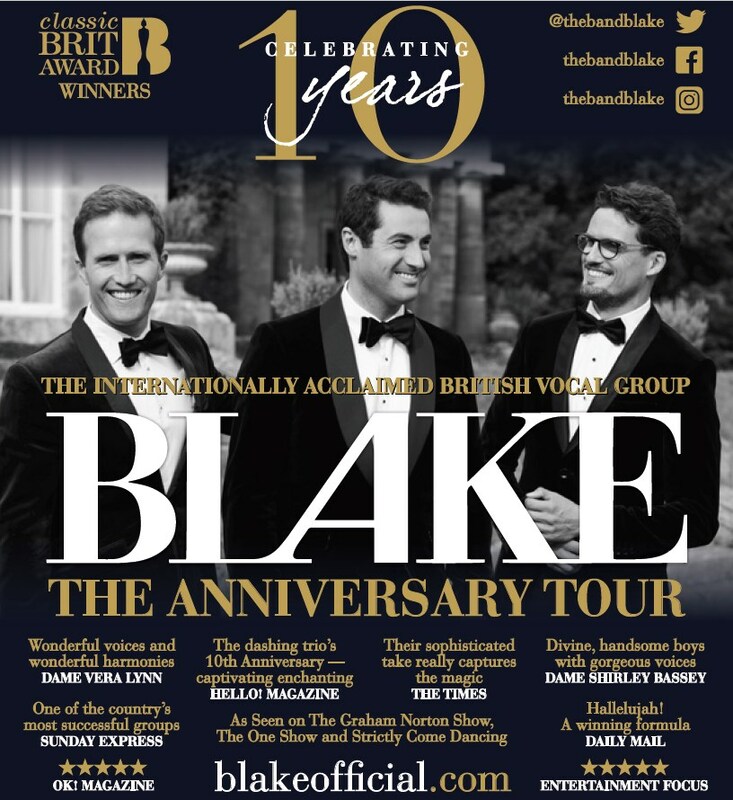 BLAKE are delighted to announce that their 10th anniversary album has reached No.1 in the official UK Classical Artists Chart, a wonderfully fitting way for the band to celebrate ten years together and thank all their fans who have supported the boys tirelessly around the world during that time. The boys will now be touring the songs from the new album around the UK in their ‘Anniversary Tour’ visiting 30 theatres over the next few months. Tickets are available via the ‘Buy Tickets’ section of this website. Hitting number one, with an album that BLAKE made independently made on their own record label really is a dream come true for Stephen, Ollie and Humphrey, who were last at the top of the charts in 2010 with their 3rd album ‘Together’. Coming back eight years later to repeat that achievement was made possible through the incredible support of BLAKE’s fans around the world, who pre-ordered the album on both PledgeMusic and Amazon, along with spreading news of the record far and wide. Media personalities & friends of the group hit Twitter, Instagram and Facebook to lend huge support too, including Carol Vorderman, Alexandra Burke, Joe Mcfadden, Lee Mead, Mcfly, Gaby Roslin, Camilla Kerslake & Jamie Laing, along with other independent classical-crossover artists keen to help the trio capture the top spot. Thank you everyone! If you’d like to enjoy the music from the album as it was designed to be heard, then be sure to book tickets for the trio’s current UK tour via this website. The show features eight songs from the new album, plus twelve classics from their earlier records and 4 fully accoustic numbers, along with huge projections, atmospheric lighting & the boys famously off-piste banter. The boys really enjoy being on tour, on stage and singing live, so don’t miss them in this huge celebration tour around the UK. Would go see them if they were at any theatres in Shropshire but sadly they are not this year! They said they would return to Festival Drayton Centre, Market Drayton last December at their Christmas concert but this appears to be not on the cards now! Too many dates east & south of UK really with nothing in Shropshire or Wales! Most disappointing as album is fantastic, can’t stop playing it & would love to hear the songs live. As no concerts in Shropshire we took off to see Blake at Redditch & they were fantastic! A wonderful concert ! I would say though that only 7 songs were from the new album & not 8 as stated above, all utterly brilliant! There were 4 accoustic numbers but only 8 of their old classics & not 12 as above! 19 songs in total & not 24 as indicated there would be but all superb, a good mix of songs to suit all tastes. Very enjoyable.